What’s a parklet? It’s a mini public park in an urban area. Essentially, it’s a great idea. Last Friday, the L.A. City Council approved the construction of four parklets in Downtown L.A., El Sereno and Highland Park. This is great news for our city, as it signals a move toward prioritizing open space. Los Angeles has a severe lack of open space. We need more. Much more. So, yay for parklets! If ever the city council approves more, where would you like to see one? 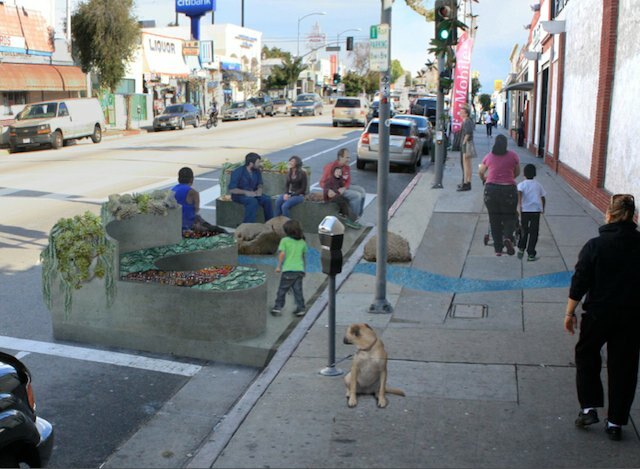 I would love for there to be a parklet on Melrose, somewhere east of Fairfax, west of La Brea. You know, where all the (affordable) shopping is. Los Angeles lacks good, urban shopping districts. Melrose is a good one, but there’s nowhere to grab a bench! Think of good shopping districts in other cities: Union Square in San Francisco, Herald Square in NYC, SoHo NYC, L.E.S. NYC. All have lots of little parks with benches. You know, to sit on. To rest on. To survey your city on. What a novel idea. Except that it’s an idea as old as civilization, and has been proven, over and over again: parks (or parklets) are essential to a city’s quality of life.